In Calgary, our security services are comprehensively designed to meet the unique needs of your residential or commercial needs. We have a team that can meet any specialized need as well. Optimum Security is a leading, trusted security guard and patrol service recognized in Calgary. Each of our well-trained officers are equipped to handle challenging environments and safety concerns. And, we work closely with Calgary’s law enforcement officers to ensure a seamless transition and ample peace of mind. Protecting your property, people, and assets is our goal. Our residential alarm systems can monitor for any risks including home invasion. They also work as a tool to detect other risks impacting your family such as carbon monoxide levels, smoke, and fire. We provide fully accessible, two-way and hands-free community systems to allow the security team to monitor any space for emergency needs. More so, we also offer uniformed guard services in Calgary designed to monitor your property whenever you are not there. Perhaps the best way to ensure comprehensive protection is with our on-site, trained professionals. These are uniformed security personnel who will patrol the area for safety. Additionally, with their clear presence, the risk of break ins or other trouble is much less. When you choose our team at Optimum Security, your Calgary property is always well maintained. We’ll monitor for any signs of fire, smoke, or other risks while providing ongoing support for emergency situations. 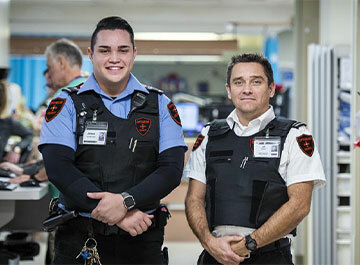 Each of our Calgary security guards is ready to provide outstanding support and care to our clients. With this type of peace of mind, any business or homeowner can feel protected and safe. To learn more about our Calgary security guard services, call us directly for a consultation and a quote.